Hello, I would like to know, because I have to give a talk on the subject, what happens to the products of photosynthesis of a tree? More specifically, the fruit. Your question is somewhat ambiguous. A fruit isn't the product of photosynthesis, but rather the product of fertilization. Fructification fits into the process of plant reproduction. Sugars are the products of photosynthesis and allow the tree to grow. Oxygen is also produced during photosynthesis, but is released by the leaves into the atmosphere. You can see animation on photosynthesis here. 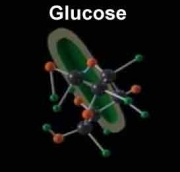 Glucose, a sugar, is produced during photosynthesis. Sugars from photosynthesis are essential to the tree for tissue construction. When the tree produces fruit, when its trunk thickens, when it blossoms or when it's constructing new leaves or branches, the tree uses photosynthesis sugars. This is called the source-sink relationship: the leaves are the source of sugars obtained during photosynthesis and the tissue growth is the sink consuming these resources. It's important for the tree to manage these resources, it's like when you decide on a monthly budget that you must follow. You can see a movie about resource allocation here. Some of these sugars are also stored in the trunk, branches, and roots of the tree. These reserves are used, for example, to survive stresses that would damage the tree or to build new leaves in spring. You can read here a text on rays that talks about this subject. Sugars are transported by the sap. It is also called "descending sap" because it originates from the top of the tree and goes down. This is a more viscous sap than the ascending sap, an aqueous solution of mineral ions absorbed by the roots, which rises in the tree. I hope this information answers your question.